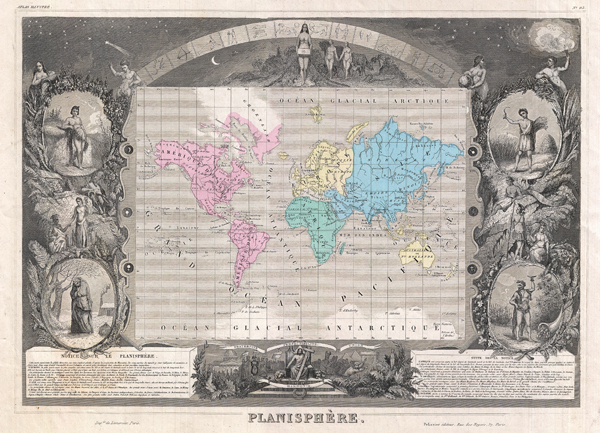 A visually stunning decorative map of the world dating to 1852, by French map publisher Victor Levasseur. Levasseur depicts the world on a Mercator Projection, showing the six known continents as well as traces of Antarctica. The cartographic style of this piece is minimalist, but a few elements do bear special note. These include the extension of Oregon territory well into British Columbia, reflecting the American claims that later led to the 54' 40' dispute. Also in North America, Texas is identified as an independent nation. Far to the north both the Northwest Passage over America and the Northeast Passage over Europe and Asia, are drawn as open and practically navigable waterways. This particular map is surrounded by four medallions bearing allegorical representations of the seasons. Spring, in the upper left, is represented by a young unclothed woman modestly covering herself with garlands. Summer, in the lower right, is a powerful bearded man wearing an animal skin and surrounded by the bounty of life. Fall, upper right, is a young man reaping the harvest. And winter, lower left, is a huddled old woman in a barren snow covered setting. Published by V. Levasseur as page no. 95 in the 1853 edition of his Atlas National de la France Illustree.